Parents of color want California’s next governor to place a higher priority on improving public schools, a new poll finds. But as the two gubernatorial candidates held their first and perhaps only debate Monday, education barely came up. Republican businessman John Cox three times mentioned that the state’s schools are failing children, but there was no follow-up discussion. 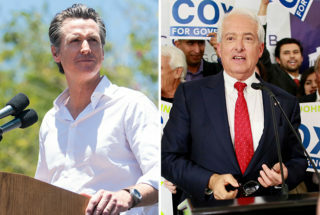 Gavin Newsom, Democrat and lieutenant governor, brought up schools only as part of his defense of sanctuary cities, which he said offer protections that make parents “more likely to get their child an education and drop them off at school” and to get immunizations such as for the flu. “We didn’t talk about education, but the schools are failing our children. That is a future that we are giving up,” Cox said in closing. Even the moderator of the hour-long radio forum, KQED’s Scott Shafer, acknowledged important topics that weren’t addressed, listing first education, along with pension reform and health care. But a new poll of the state’s Latino, black and Asian Pacific Islander parents revealed that 9 out of 10 say improving K-12 education should be a high priority for the next governor. More than half said it should be an extremely high priority. The poll, released last week and conducted by Goodwin Simon for The Education Trust—West and UnidosUS, found that improving public schools ranked higher than expanding access to health care and addressing the lack of affordable housing on a list of priorities for the state’s next governor. “Parents of color really want educational justice in California, and they expect the next governor to prioritize that,” said Elisha Smith Arrillaga, co-interim executive director of Education Trust—West, which released results from polling 600 parents of color, evenly split among black, Asian and Latino. Three out of 4 black parents called improving K-12 education an extremely high priority, as did 2 out of 3 Latino parents. And more than half of black and Asian Pacific Islander parents, and about half of Latino parents, said K-12 schools are on the wrong track or they were unsure if they were on the right track. The poll also addressed parent engagement, which schools are held accountable for in order to receive federal funding. The new Every Student Succeeds Act requires outreach to all parents and meaningful involvement with parents. Parents of color are giving feedback at schools and feel comfortable calling for changes, but they said they face barriers and are at times doubtful that they can prompt meaningful change. Among all groups, a strong majority — at least 8 in 10 — said they are likely to offer feedback to their children’s school. And 9 out of 10 black and Latino parents and 7 out of 10 Asian Pacific Islander parents feel comfortable pushing their child’s school to make changes. But just over half of black and Latino parents, and just 1 out of 3 Asian Pacific Islander parents, think it’s very possible for parents to make a difference in improving school performance. • Read more on the California parent poll here.